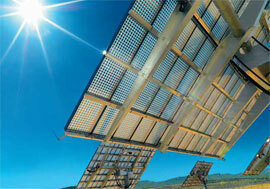 Soitec SA (Bernin, France) has announced the industry’s first four-junction solar photovoltaic (PV) cell. This cell has achieved a peak conversion efficiency of 43.6%, as confirmed by co-developer Fraunhofer ISE (Freiburg, Germany). The company achieved the 43.6% efficiency at a concentration of 319 suns, and notes that the new cell has demonstrated a greater than 43% efficiency over a concentration range between 250 and 500 suns. Soitec states that it expects this four-junction technology to exceed the efficiencies of triple-junction PV cells. “Boosting efficiency levels is a key step in outperforming the economics of conventional PV. This great achievement brings strong value to our solar division and validates our strategy and business model in the solar market,” said Soitec CEO André-Jacques Auberton-Hervé. Design comprises two dual-junction sub cells. The new four-junction design uses two dual-junction sub cells grown on different III-V compound materials, which allows band-gap combinations to capture a broader range of the solar spectrum. In developing the cell, Soitec used its proprietary semiconductor bonding and layer transfer technologies, which have been used in the semiconductor industry for decades. The new cell was developed in collaboration with Fraunhofer ISE and the Helmholtz Center for Materials and Energy (Berlin), which developed and deposited III-V epitaxial layers on new base materials as well as fabricating and characterizing the device. CEA-Leti (Grenoble, France) also participated in the project.